194227 Toshiba ES-10S Auto Handle Flash w/Camera Bracket + Sync Cords - Works! Toshiba ES-30 With Case - Fast Fre Shipping Japan. Condition is Used. Shipped with USPS Priority Mail. Flash good condition. This flash works well. Flash is tested - everything is working as should. 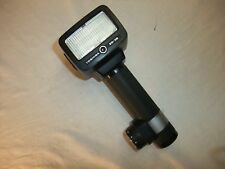 Great simple flash for 35mm or 120 photography. Test button works. Used, in very good condition with minor signs of use/wear. Tested and works well. Requires 4 AA batteries. All accessories/shoes/apparels contain no foul order unless noted. All accessories/shoes/apparels should be cleaned/washed first to your ideal condition before use. Toshiba ES-25L Flash “Vintage” Good Condition! Center Contact! Tested! Rare! Up For Sale! Toshiba ES-25L Flash “Vintage” Good Condition! Center Contact! Tested! Rare! very light vintage wear Check Photos! Nice Flash! Good condition Fast Free Shipping Please see photos for cosmetic details. This item is a Toshiba 316 Electronic Flash Unit with original instruction booklet. Beseler Toshiba 915. You will get the flash in the pics. I am committed to you. Flash fires. I participate from Japan. So I can provide you the best service. Appearance is beautiful, (EXCELLENT condition). POOR APPEARANCE. ■ Appearance. EXCELLENT condition. IncludingUser Manual, Synchro Cable. B EXCELLENT Excellent condition with minor signs of use. B-GOOD Good condition with apparent signs of use, but works well. Serial No.T01318. [Exc] Toshiba QCC-3600 Flash Unit w/ Blacket& cord. flashing lit checked. Appearance More abrasion. We are Japanese. This is a Toshiba 7025 Universal Electronic flash. It has been checked and tested, and it is working perfectly. No battery corrosion. Function:(Flash,Filmback,Neck strap,Hood,Front/Rear cap,Accessories, etc. ). Let's solve the problem together. Perfect Inspection by Japanese Staff with High Skills. However,I will provide courteous and responsive service. TOSHIBA QCC 3 Auto FlashS/N Q05870. Working Condition : PERFECT Fires as new without problems. I give your money back if it is not as described. This item is very clean. Grade:Excellent Condition. 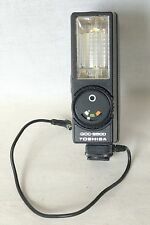 Toshiba A-25L shoe mount flash unit flashgun. Made in Japan flash is in good condition. Check my other items. Combined shipping available. All images are of the actual item for sale. We also use used boxes when we can. Unless otherwise stated, ONLY what is shown in photos is included. Toshiba ES-30 Flash for Parts. This flash has not been tested, it is for sale for parts or repair only, as-is. There is typical wear and tear apparent on this item. Scuffing and scratches are generally present throughout.